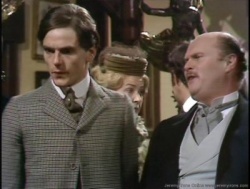 Jeremy Irons (born 19 september 1948) is a British actor who played in 1971, for his first role on television, Nephew George in episode The Case of the Mirror of Portugal of the TV series The Rivals of Sherlock Holmes. 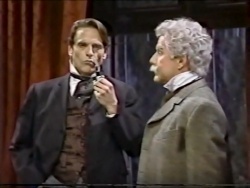 In 1991, he played Sherlock Holmes in the sketch Sherlock Holmes Surprise Party in the TV show Saturday Night Live with Phil Hartman as Dr. Watson. This page was last edited on 2 February 2019, at 00:45.